Poultry manures and litters are an excellent source of crop nutrients—ones that can be more easily accessed by the crop when Extract PBA or Accomplish LM is used. In the corn trials below, these biocatalyst technologies maximized nutrient release from poultry manures so that more nutrients were available faster to the crop, leading to higher corn yields. 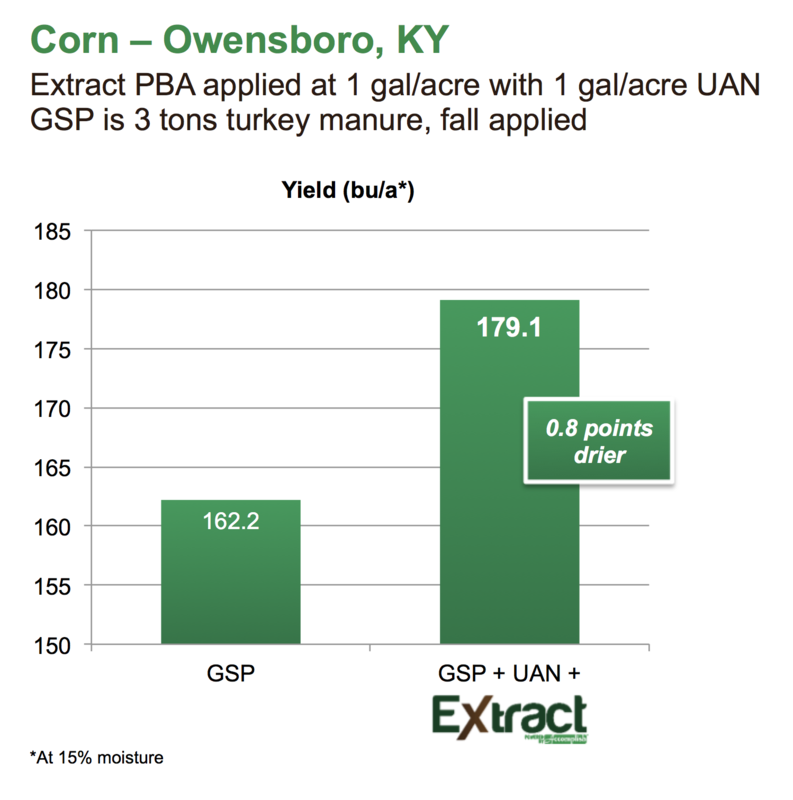 In a trial conducted in Kentucky, Extract PBA was spread with UAN over turkey manure in the fall. Soil samples from the treated and untreated plots were taken in January, and showed an increase in the availability of many nutrients with the Extract PBA application. 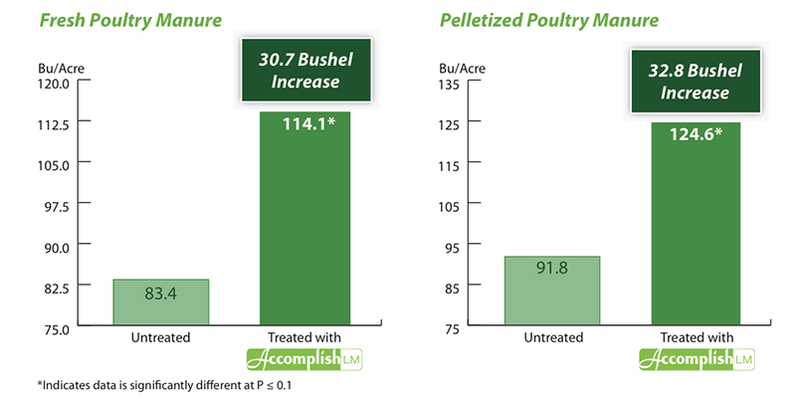 At harvest there was a 16.9 bu/acre corn yield increase where Extract PBA had been applied. 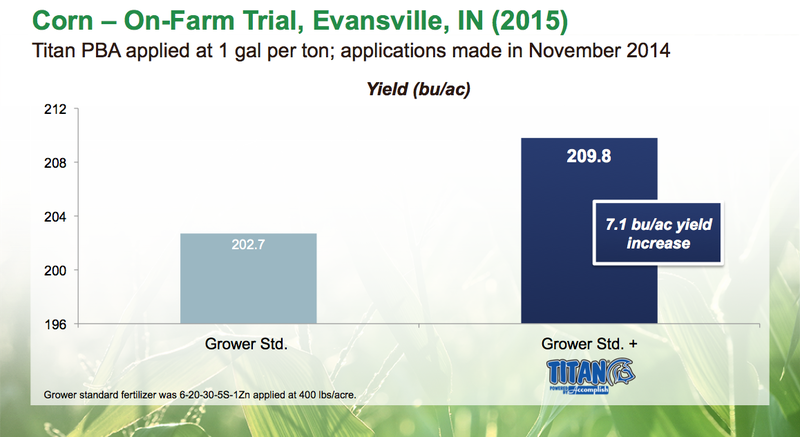 As the harvests come in this year, we’re seeing great yield performance with Titan PBA. Here are more results from some of this year’s trials on corn, wheat, soybeans and rice in Arkansas, Indiana and Kentucky. 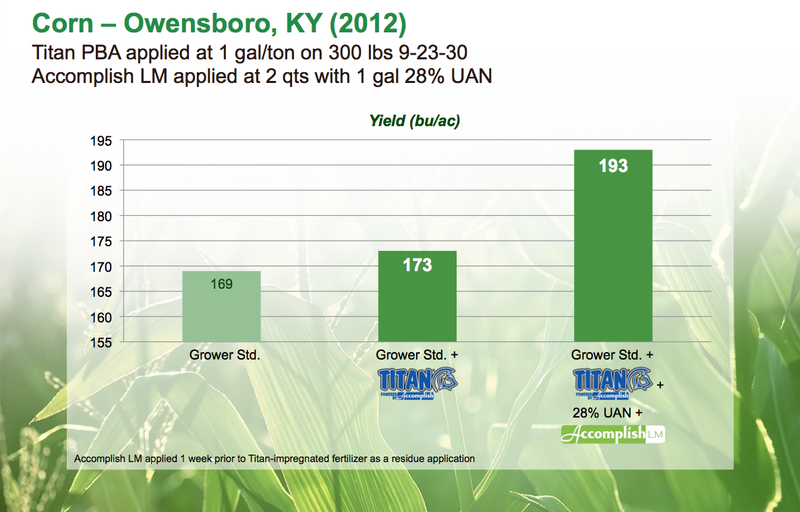 Using Accomplish LM in a plant nutrition program is a great way to add more bushels to your yield. Just ask Alex Dean, an independent crop consultant and founder of Dean Crop Services, located in Northeastern Arkansas. After hearing about Accomplish LM, Alex had one of his grower clients put it to the test. “I have a grower who likes to stay up-to-date on the latest products. He’s been using Black Label Zn in his rice fertility program for the past three years, with really nice results. 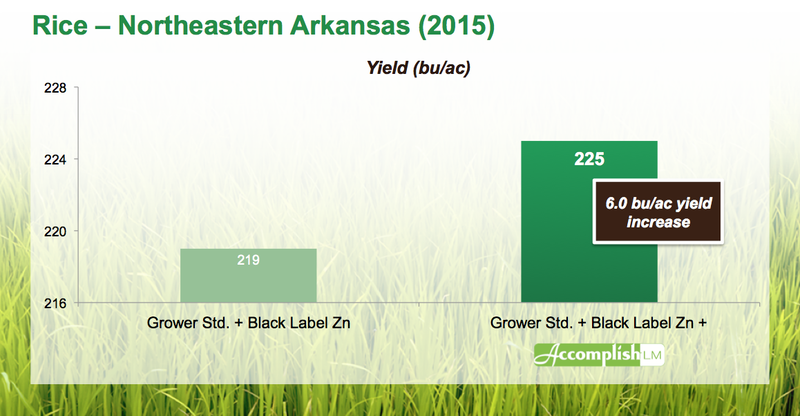 After I learned about Accomplish LM, I asked him to try it out with Black Label Zn on a test plot,” says Alex. The grower tested a fertility program with and without Accomplish LM on two adjacent 40-acre rice fields. Both fields had 4-5 levees, but only the levees in the untreated field were planted. Norman McPherson and M.H. 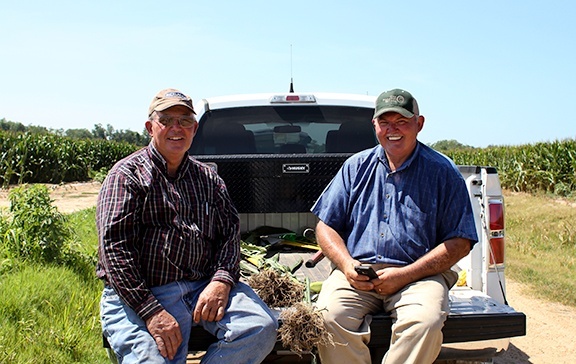 Bitely are growers in Grady, Arkansas, who incorporated both Accomplish LM and Titan PBA into their fertility program for this year’s corn. Both growers applied Titan PBA on their dry fertilizer in the fall, and included Accomplish LM with their standard liquid starter fertilizers at planting. 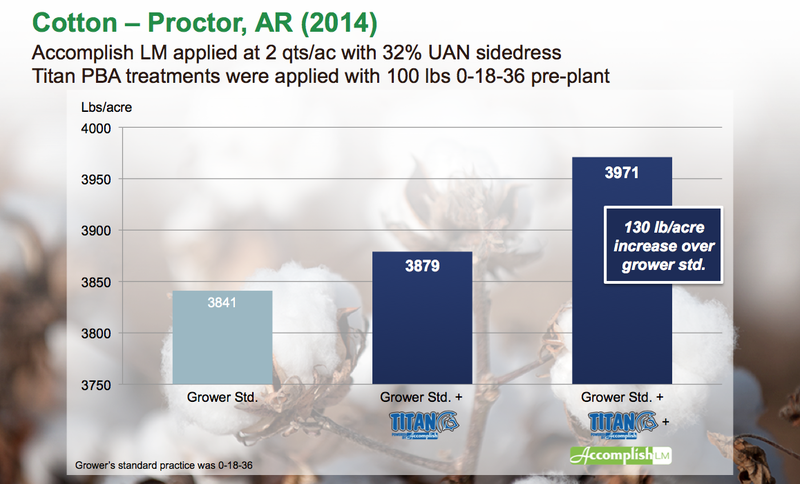 With the potential for low cotton prices, cotton growers will need to make the most of their fertility investment to optimize yields and ROI on their 2015 crop. A key component of maximizing return under current conditions involves both reducing the number of trips to the field and improving the efficiency of existing fertility practices. Plant health products such as Accomplish LM and Titan PBA are a great fit in these times. By using these products either alone or in combination to improve nutrient availability and uptake, cotton growers can make better use of their applied nutrition and enhance their nutrient use efficiency. Accomplish LM and Titan PBA also have great flexibility, showing excellent performance when applied pre-plant, in-furrow/2x2, with sidedress applications and with herbicide applications (Figures 1 & 2). Since both Accomplish LM and Titan PBA are based on the same biochemical technology, many growers who use these products ask which is the better one to use. Should they use Accomplish LM when they make one of their liquid applications? 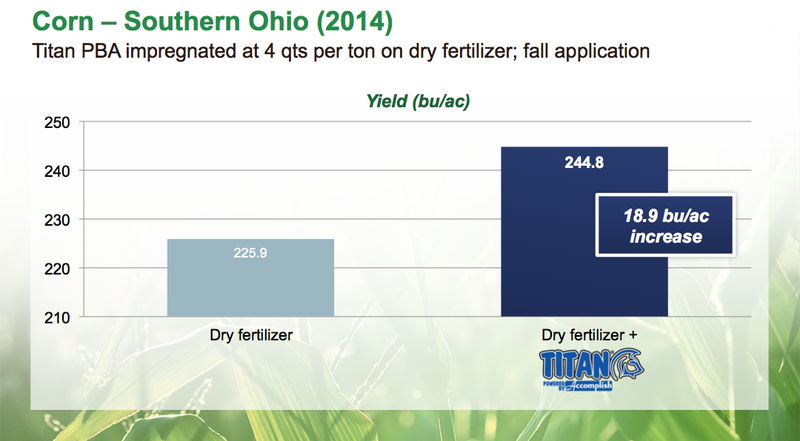 Or should they use Titan PBA when they make a dry fertilizer application? Does one give them a better “bang for their buck”? Throughout the Southeast, growers are increasingly incorporating poultry litter into their fertility programs. One reason for this trend is the increasing price of commercial fertilizers, which makes poultry litter an enticing option for growers due to its cheaper cost and nutrient benefit. However, one drawback with organic fertilizer sources such as litter or other manures is that large portions of the analyzed nutrients are bound in plant-unavailable forms. How, then, can growers increase the availability of the nutrients within poultry litter?